11:07 pm - Fun with clothing coordination, aka too much free time. 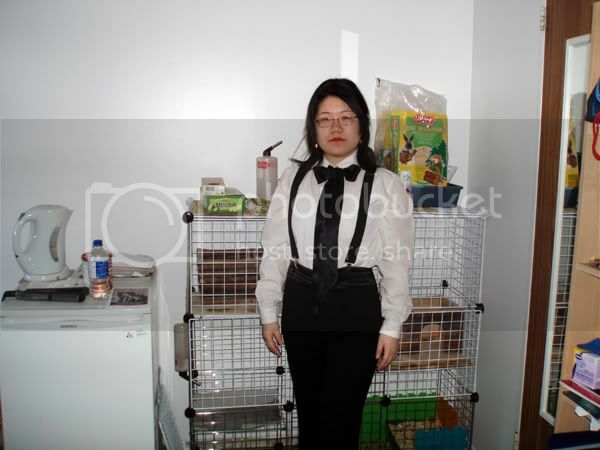 Yes, that's my bunny's cage behind me in case anyone was wondering. I think the outfit wouldn't look bad with a tie either instead of the scarf-tied-in-a-bow, or just a small bow-tie. 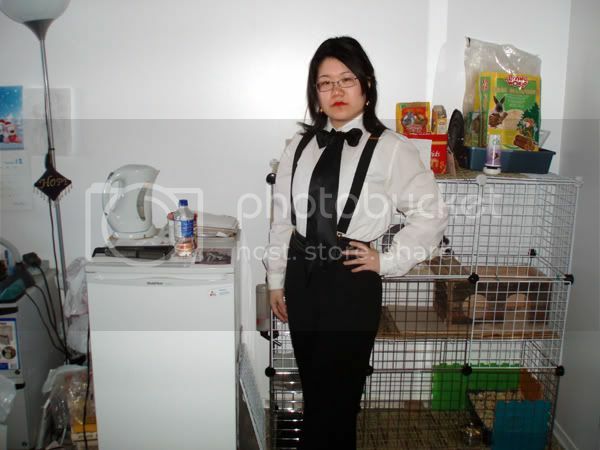 And although it would hide the suspenders, a little black vest would look cute too I think. I've become really attached to those suspenders actually, they really do work and saves me the trouble of constantly having to pull my pants up as I walk. The only problem is 1) going to the bathroom I have to detach them and re-attach and 2) my boobies are too...full (lol) and makes the suspenders sit weirdly, in these photos I have on a really tight tank top underneath that's litterally smooshing my boobies down and even then you can still see the bumps -___- I guess there's a reason (or two in this case) why they were originally a fashion adopted by the male gender instead of the female. [EDIT]: Apparently there was a complete, lunar eclipse tonight that just passed, viewable by all except those in Asia and Oceania (since they're in the middle of the day over on that side ^^;;), did anyone see it? There's a facebook group for it with some amazing photos. The next total lunar eclipse is scheduled for December 21st of 2010 I believe. Oh, and apparently Saturn was to the left of the moon...I'm guessing just a bright little speck in the night sky unless you had a telescope? Kind of coincidental since my roommate mentioned how full the moon was when we were out finishing up some shopping around 7pm. I saw it last night and it was pretty amazing (although freezing cold outside). Didn't bother taking any pictures, though, since I assume my camera is too crappy to take decent images at night. Yeah I have too much time...waaaaay too much.